Hanergy Thin Film Power Group has announced that solar energy testing laboratory Fraunhofer ISE CalLab PV Modules has rated the company’s US-based subsidiary Alta Devices‘ newest solar production module as the highest efficiency single-junction solar module ever produced. With its record setting 25.1% conversion efficiency, the module can be used to power a range of products such as unmanned aerial vehicles (UAV), electric vehicles, and smart sensors that were previously limited by low efficiency solar solutions. 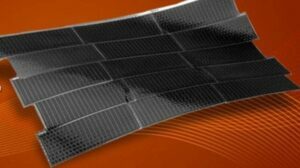 Alta’s innovative GaAs modules perform at up to 2 times that of ordinary flexible solar cells, making them the current world leader in terms of module efficiency for thin film solar technology. Since 2010, Alta’s GaAs single-junction cells have broken conversion efficiency records four times and still hold the world’s highest (lab) conversion efficiency rate of 28.8%.